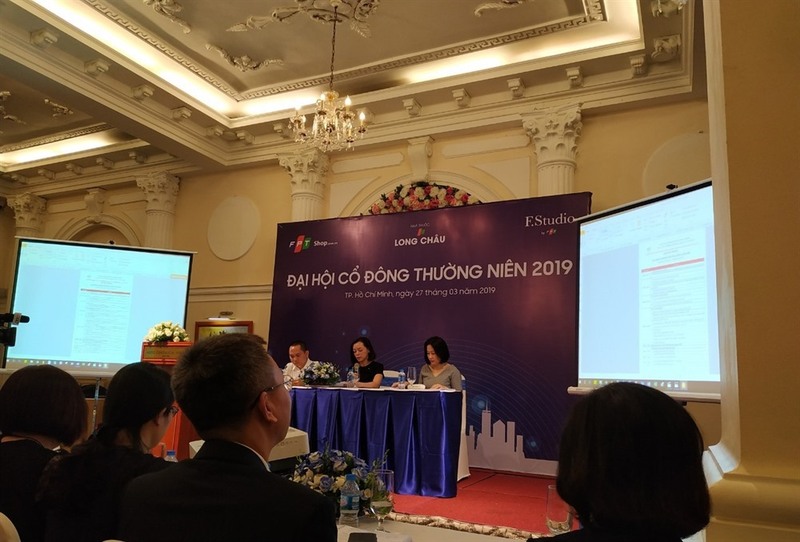 HÀ NỘI — FPT Digital Retail JSC (FRT) is aiming for VNĐ17.8 trillion (US$76 million) and VNĐ418 billion in net revenue and post-tax profit this year, up 16 per cent and 20 per cent year-on-year, respectively. The information was released during the company’s annual shareholders’ meeting held in HCM City on Wednesday. The company, under the umbrella of leading technology, outsourcing and IT services group FPT Corporation, operates in the field of retail trade. Major products include electronics and appliances, computers and software. At the meeting, shareholders approved the plan to pay 2018 dividends at a rate of 25 per cent, of which 10 per cent will be paid in cash and 15 per cent in shares. In 2018, the company’s after-tax profit reached VNĐ348 billion. It planned to spend VNĐ170 billion on dividends. The payment is expected to take place in the second or third quarter of this year. After the share issuance, its charter capital will increase to VNĐ790 billion ($34 million). In 2019, FRT’s board of directors plans to pay dividends in cash at a rate of no less than 10 per cent. Nguyễn Bạch Điệp, chairman and CEO of FRT, said the company planned to expand its Long Châu pharmacy chain to 70 stores to increase its presence nationwide. Although the number of Long Châu pharmacies was still small, the monthly revenue from each store was around VNĐ3 billion, much higher than the revenue from normal stores that brought in VNĐ300-400 million per month, Diệp said. FRT’s pharmaceutical retail segment is divided into three channels, via hospitals, clinics and pharmacies. The company is aiming to hold 30 per cent market share of the country’s pharmaceutical retail industry via pharmacies in the next three to four years. Under this plan, the pharmaceutical retail segment is expected to contribute about 40 per cent of FRT’s revenue, estimated at VNĐ10 trillion. In the future, the company will also focus on developing logistical services, increasing selling points and improving personnel training. This year, FRT also aims to collect VNĐ1 trillion in revenue from sales of electronic accessories, an increase of VNĐ350 billion compared to last year. At the meeting, shareholders also approved a plan to issue 680,000 shares under the Employee Stock Ownership Plan (ESOP) programme at a price of VNĐ10,000 per share. In the last six years, FRT has accepted installment payments for the sale of its products. Revenue from this accounts for 32 per cent of the total. FRT shares have dropped 33 per cent this year, from VNĐ71,600 per share on January 2 to end Wednesday at VNĐ47,000 per share. Explaining the sharp decline, FRT’s board of directors said the company had been trading on the market only bfor less than a year so they had little experience in stock prices.